Self doubt is one of those issues that every artist struggles with. During the 2015 Augusta Plein Air Fest, the painting above won 3 awards to my surprise and delight - Best of Show, 1st Place Oil Painting and Artist's Choice. It almost didn't win anything. I went out on a sunny Wednesday afternoon to Femme Osage, Missouri and was immediately struck by the scene. A beautiful pattern of 19th century gravestones leading towards an old schoolhouse. The scene was so beautiful, it just flowed. I didn't completely finish the painting in the first two hour session, but almost. That evening, the doubts kicked in. I asked myself all of the usual questions. Was I happy with the color, the values, the textures of the paint? Was it too tightly rendered? Were parts of it too loosely rendered? But one question ate at me - was it too morbid? I decided I would scrape it off the next day and paint over it. Every artist needs a true confident, and my wife Kimberly is mine. I sent an image of the painting in progress to her, and her positive reaction was what saved it. I decided to go back the next day and finish the painting, and all my questions came together in one solution. The image was really about the schoolhouse. The gravestones would stay loosely rendered and the schoolhouse would become the focal point. An hour later it was finished, I was satisfied, and I had the final painting ready to submit for judging. 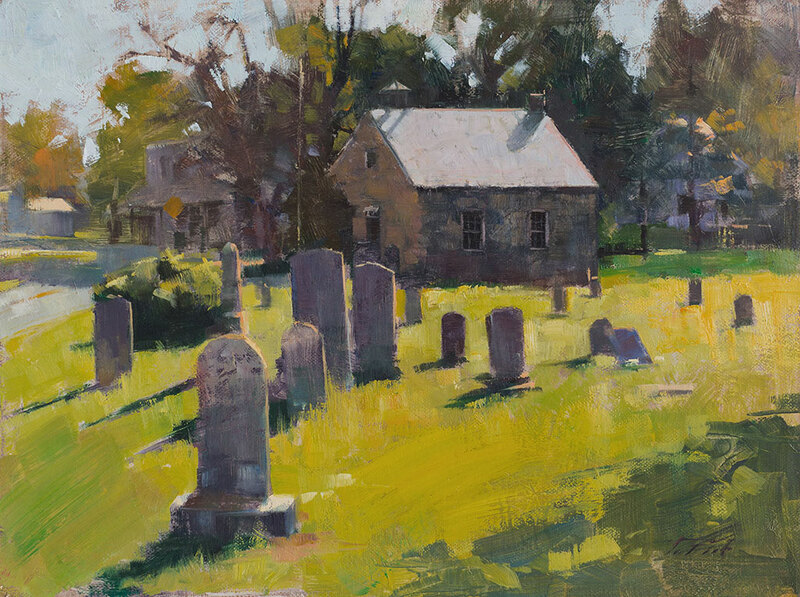 Read about my complete Augusta Plein Air 2015 experience here.